Scientists have discovered a new way that carnivorous plants catch their prey, using the power of raindrops to flip insects into their trap. Tropical pitcher plants have evolved specially adapted leaves that form a deep bowl, partially filled with digestive fluids, and with a little lid projecting over the top to stop the plant from getting filled up with rainwater. The plants produce nectar to attract insects and set various traps to catch them - the inner wall of many pitchers is covered in platelet-shaped wax crystals that become extremely slippery when wet. The pitcher plant, Nepenthes gracilis, is unusual because they also produce crystals on the underside of their lids - and researchers wondered whether the lid itself is involved in helping to trap prey. After all, for an insect to cling upside down, right over the trap, is a very precarious position to be in. Watching these plants in northern Borneo, Ulrike Bauer of the University of Cambridge and her team, saw ants happily walking upside down on the pitcher plant lids and not falling in. Then, during a rain shower, they happened to spot a ladybird crawling beneath the pitcher lid to take shelter only to be flicked by a raindrop into the trap. To test whether lids really are helping to trap prey when it's raining, the team took some pitcher plants and ants into the lab and doused them in showers of artificial rain. They found that around 40% of all the ants visiting the pitcher were caught when it rained. And when the rain was switched off, no ants fell into the traps showing that the lids aren't becoming more slippery with increased humidity after it rains. Performing the same tests on pitcher lids cut off and mounted with a paper clip gave a very similar result. When it's raining, ants find it much harder to hang on. Back in the field, adding a smear of anti-slip silicon to the underside of pitcher lids made them much less efficient at catching prey in the rain. 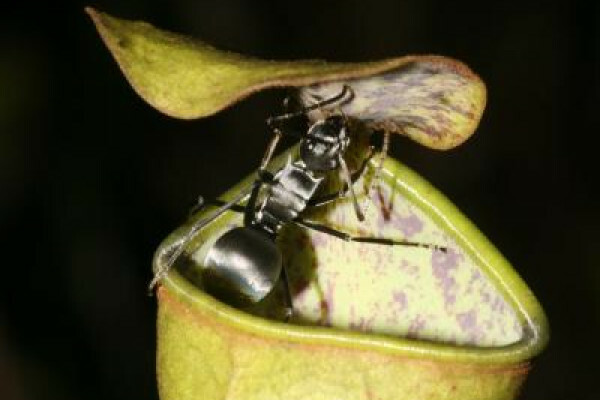 The paper appears in the journal PloS ONE and is accompanied by video clips of the ants having a tough time getting to grips with the pitcher plants in the rain. So it seems that Nepenthes gracilis has evolved to be a lid specialist - they make more nectar in their lids than other pitcher plants, and the team also found the crystals on their lids have a different microscopic structure than other plants, letting ants hang on in dry conditions, but the vibration of raindrops is enough to catapult them into the digestive juices. It's thought that the ants that escape when its dry act as scouts returning to their colony and bringing back lots more ants. And living in very rainy places, chances are that when the ants return, they could find that the heavens have opened and the pitcher plant is a much more dangerous place to be.